Amanda Anisimova is the youngest American to reach the fourth round of the Australian Open since Jennifer Capriati in 1993. 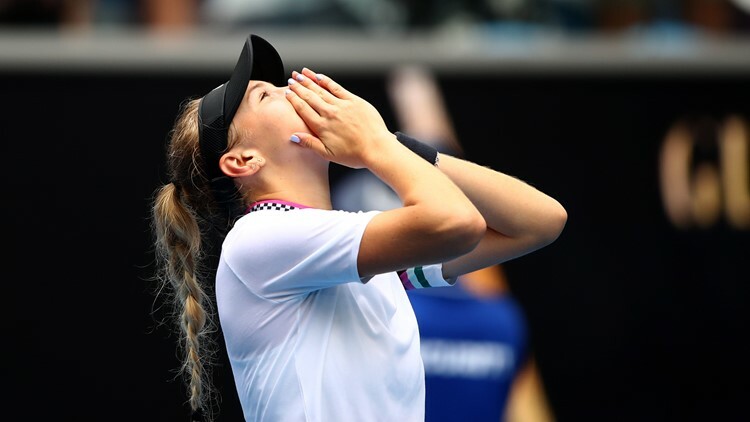 Amanda Anisimova of the United States celebrates winning match point in her third round match against Aryna Sabalenka of Belarus during day five of the 2019 Australian Open at Melbourne Park on January 18, 2019 in Melbourne, Australia. 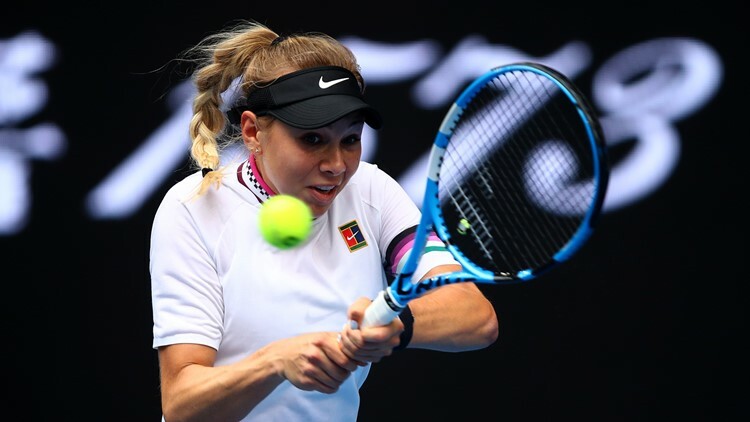 Amanda Anisimova of the United States plays a backhand in her third round match against Aryna Sabalenka of Belarus during day five of the 2019 Australian Open at Melbourne Park on January 18, 2019 in Melbourne, Australia. On a rainy afternoon that saw the roofs closed atop the three main courts, and play delayed on smaller arenas, Sharapova advanced to face No. 15 Ash Barty of Australia, while 2017 U.S. Open champion Sloane Stephens beat No. 31 Petra Martic 7-6 (6), 7-6 (5) and now meets Anastasia Pavlyuchenkova of Russia. Also advancing was 2010 Wimbledon runner-up Tomas Berdych, a 5-7, 6-3, 7-5, 6-4 winner over No. 18 Diego Schwartzman. Berdych's next opponent will be 17-time major champion Rafael Nadal, who beat 19-year-old Australian Alex de Minaur 6-1, 6-2, 6-4. No. 22 Roberto Bautista-Agut swept No. 10 Karen Khachanov 6-4, 7-5, 6-4 and will face the winner of the day's last match between 2014 U.S. Open champion Marin Cilic and No. 26 Fernando Verdasco. Frances Tiafoe, an American who turns 21 on Sunday, got to the fourth round at a major for the first time by defeating Andreas Seppi of Italy 6-7 (3), 6-3, 4-6, 6-4, 6-3, a win he celebrated by pulling off his shirt. Tiafoe now meets No. 20 Grigor Dimitrov, who is being coached by Andre Agassi.